From the controversial "Perfect Sunday" instagram post, here comes John Lloyd Cruz with Angelica Panganiban on the cover of The Buzz magazine October 2012 issue! 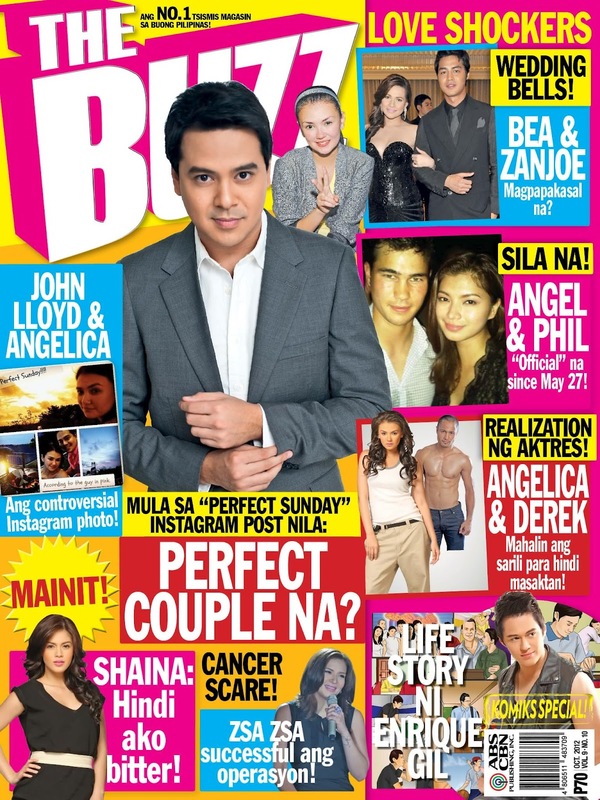 Aside from John Lloyd and Angelica's romance, inside the latest issue of The Buzz magazine are interesting features about Shaina Magdayao, Enrique Gil, Zanjoe Marudo & Bea Alonzo, Angel Locsin & Phil Younghusband, the realizations of Angelica Panganiban towards Derek Ramsay, and a lot more! The Buzz Magazine October 2012 issue is now available at all magazine stands, bookstores and selected supermarkets nationwide. So, grab your copy now! This blog is for the collection of the global and local news, pictures and videos which are significant for public viewing and for viewer's interest. Turtz on the Go warrants that not all of graphics, forms, videos, pictures, and other contents of this blog are original and copyright of Turtz on the Go and has not been published by other journals. OTHER contents are linked from youtube.com, facebook.com, and some are under consideration of the respective journals, blogs and websites and Turtz on the Go claims no credit for any content featured on this site unless otherwise noted.